David Brodziak has been making knives from his home in Albany, Western Australia since 1989. David is an established full time maker and is accredited with numerous awards for his artistry with knives. 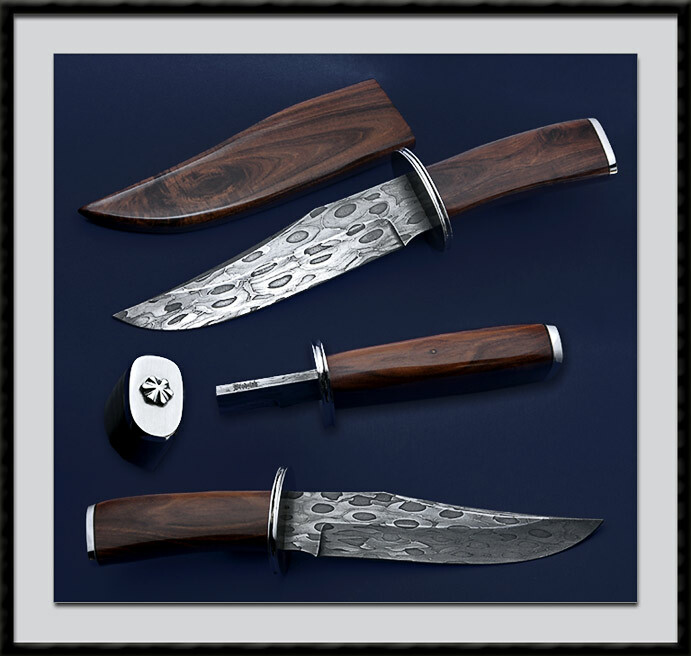 He has earned an excellent reputation for his fine craftsmanship among knife collectors and enthusiasts, nationally and internationally. He makes many different styles, from miniatures to full sized swords, and everything in between. Hollow Ground Chain Saw Damascus Blade, Top Clip is not sharpened, BL = 6 1/4”, OAL = 10 5/8", 416 Stainless Fluted Guard and Pommel, Mulga Wood Handle and Mortised Matching Scabbard. The handle and scabbard are finished with a 2 part polymer coating renowned for chip proof and heat resistant qualities. New direct from David's shop.